The Redwood format stored depth in a 16-bit single channel image. The integer value represents the depth measurement in millimeters. 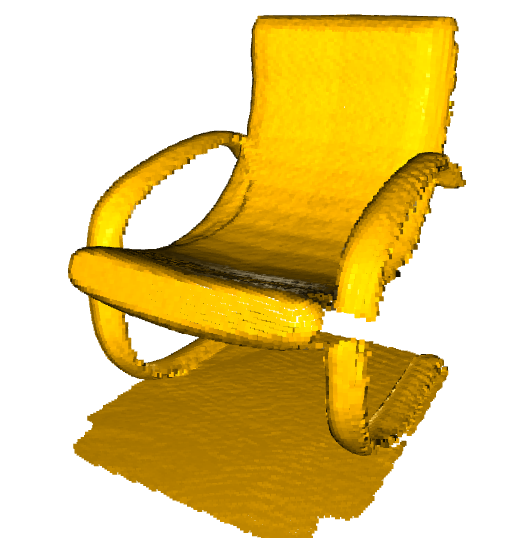 It is the default format for Open3D to parse depth images. The default conversion function create_rgbd_image_from_color_and_depth creates an RGBDImage from a pair of color and depth image. The color image is converted into a grayscale image, stored in float ranged in [0, 1]. Here we use PinholeCameraIntrinsic.prime_sense_default as default camera parameter. 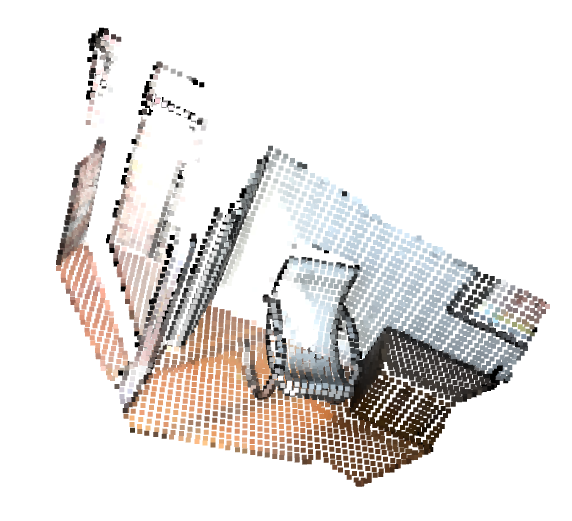 -> PointCloud with 198835 points. 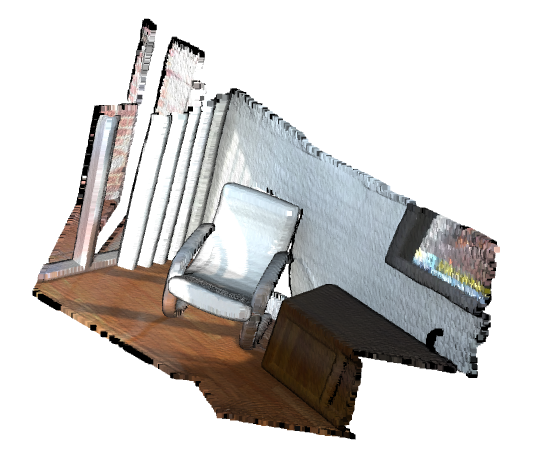 read_point_cloud reads a point cloud from a file. It tries to decode the file based on the extension name. The supported extension names are: pcd, ply, xyz, xyzrgb, xyzn, pts. 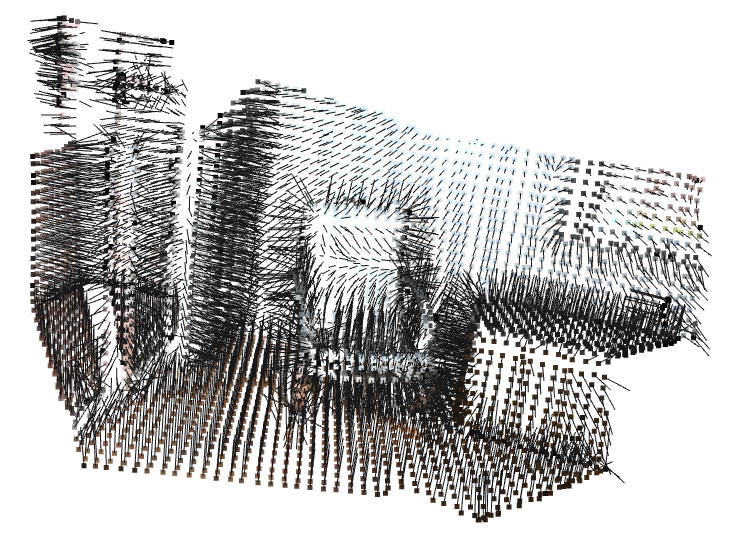 draw_geometries visualizes the point cloud. Use mouse/trackpad to see the geometry from different view point. Left button + drag        : Rotate. Ctrl + left button + drag : Translate. Q, Esc       : Exit window. H            : Print help message. P, PrtScn    : Take a screen capture. D            : Take a depth capture. O            : Take a capture of current rendering settings. 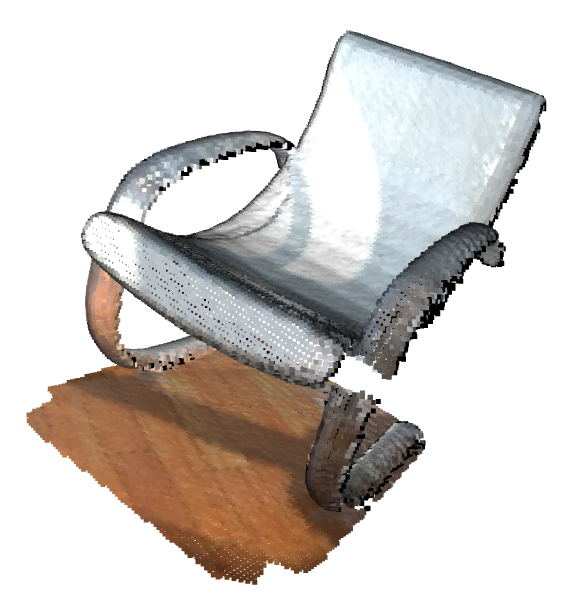 In addition to draw_geometries, Open3D has a set of sibling functions with more advanced functionality. draw_geometries_with_custom_animation allows the programmer to define a custom view trajectory and play an animation in the GUI. draw_geometries_with_animation_callback and draw_geometries_with_key_callback accept Python callback functions as input. The callback function is called in an automatic animation loop, or upon a key press event. See Customized visualization for details. estimate_normals computes normal for every point. The function finds adjacent points and calculate the principal axis of the adjacent points using covariance analysis. The function takes an instance of KDTreeSearchParamHybrid class as an argument. The two key arguments radius = 0.1 and max_nn = 30 specifies search radius and maximum nearest neighbor. It has 10cm of search radius, and only considers up to 30 neighbors to save computation time.